Gallia GOP members gather at the Bossard Memorial Library. GALLIPOLIS — Ohio Senator Frank LaRose shared his vision with Gallia County at the Gallia GOP Republican Rally Tuesday evening at Bossard Library alongside Ohio Auditor Dave Yost as the senator quests to be elected the Ohio Secretary of State. LaRose grew up in the northeast corner of Ohio in Akron. He served in the US Army for 10 years before deciding to run for the Ohio State Senate. LaRose credited much of his success politically to mentors he met in his time as a senator. He said one of his ties to the region was through State Representative Ryan Smith as they both served working on the Ohio transportation budget. LaRose said Husted and he paired to work together to improve the veteran voting process. Among his achievements, LaRose listed that he was a proponent of removing deceased individuals and non-citizens from the voting rolls in government records. 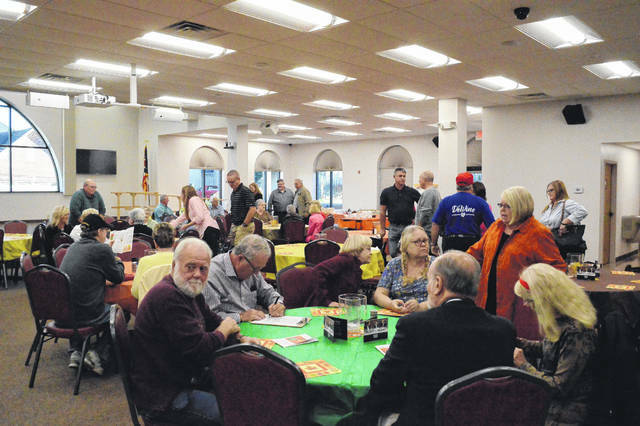 LaRose would finish thanking the Gallia GOP for its hospitality and asked for its vote.